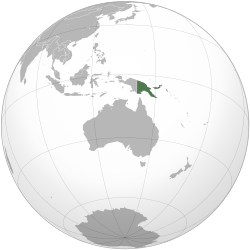 Papua New Guinea is a country near Indonesia and Australia. It contains the east half of New Guinea island and some more nearby islands. The capital city of Papua New Guinea is Port Moresby. ↑ Somare, Michael (6 December 2004). "Stable Government, Investment Initiatives, and Economic Growth". Keynote address to the 8th Papua New Guinea Mining and Petroleum Conference. http://web.archive.org/web/20060628014059/http://www.pm.gov.pg/PMsOffice/PMsoffice.nsf/pages/B6475E51C894229B4A256F6900141A4B?OpenDocument. Retrieved 9 August 2007. ↑ "Never more to rise". The National (February 6, 2006). http://www.thenational.com.pg/020606/w5.htm. Retrieved 19 January 2005. ↑ "Papua New Guinea". The World Factbook. Langley, Virginia: Central Intelligence Agency. 2012. https://www.cia.gov/library/publications/the-world-factbook/geos/pp.html. Retrieved 5 October 2012. ↑ 5.0 5.1 5.2 5.3 "Papua New Guinea". International Monetary Fund. http://www.imf.org/external/pubs/ft/weo/2012/01/weodata/weorept.aspx?pr.x=61&pr.y=6&sy=2009&ey=2012&scsm=1&ssd=1&sort=country&ds=.&br=1&c=853&s=NGDPD%2CNGDPDPC%2CPPPGDP%2CPPPPC%2CLP&grp=0&a=. Retrieved 20 April 2012. ↑ "''Post-Courier'', "Jiwaka, Hela set to go!" July 15, 2009". Postcourier.com.pg. 2009-07-15. http://www.postcourier.com.pg/20090715/news05.htm. Retrieved 2010-06-27. This page was last changed on 10 March 2014, at 12:09.